Devonridge, the heart of Waelock Shire. It is sometimes referred to as a city, but that is due more to its location than size. Situated midway between the port cities of the Idle Coast and the settlements of the eastern grasslands, Devonridge is a gateway for travellers and traders alike. It is called home by mainly the farmers, fishermen and merchants who support the town. The exact age of the town is unknown, but Devonridge is believed to be among the oldest settlements in the Outer Circle. It is one of a handful of towns that grew upon the bones of the earliest human villages as man migrated across Southern Calambria. For most of the year (if you forget about the two weeks of revelry known as Autumn Festival) Devonridge is a quiet town, perched on the banks of the Rolwood River and nestled between the great Rolwood Forest to the north and the Beckeny Forest to the south. It is often noted that the trees outnumber the houses, blanketing the town in shade, the streets meandering between the ancient trunks. Its buildings are humble, made from timber and stone. Devonridge’s most notable building, the Inn of Good Omen, is perhaps the most famous bar in Southern Calambria. It stands upon Devon’s Ridge, the hill that was once home to the town’s modern founder and namesake. With a grand timber balcony that surveys the town through the treetops, you will find the Inn of Good Omen bustling with patrons in even the quietest times. During Autumn Festival, patrons will often be lined along the stairway that zigzags up the hill to the inn’s front door. Devonridge is part of the Circle of Kingdoms, swearing fealty to the Lord Regent of Syrentium. It is governed by Lord Aldinus Gildstock, Baron of Waelock Shire, who in turn falls under the patronage of the wily Earl Gandy, Lord of Pandreyer. However, due to Devonridge’s financial independence and distance from the capital, its allegiance to the Circle of Kingdoms is mostly constitutional. 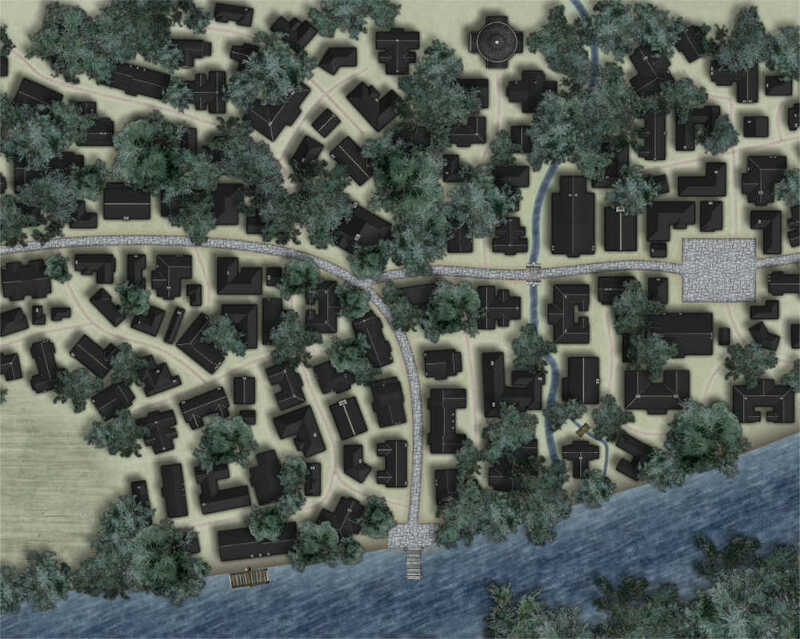 The town’s affairs are more closely governed by Waelock’s influential Merchants Guild. Security of the town is left to Captain Rusk and his small force of armed guards, known commonly as the Red Capes. For most of the year, the Red Capes have little to keep them busy, defending the town from wild animal attacks and recovering missing livestock. But then, for two weeks every year, Devonridge is transformed by an event that is famous across all of Oberyon. No one quite remembers when Autumn Festival began. Most agree that it is as old as Devonridge itself, dating back to the villages of the first Calambrians. Starting on the last day of High Summer, the annual festival was originally a feast in offering to the goddess Cha-Lei, Matron of the Hunt and Harvest. As the population grew, farmers from all over Waelock Shire came to Autumn Festival to find labour and supplies for the coming harvest. This attracted traders, who hoped to sell their wares to the congregating farmers. In turn, the gathering of traders attracted merchants and vendors from further afield. Entertainers soon arrived to earn their coin off the crowds of merchants and farmers. Autumn Festival quickly gained popularity across Central Calambria and the Outer Circle. In modern times, it has been known to attract visitors from all over the Circle of Kingdoms and even beyond, from lands as far away as Ka’Ruda and the isles of the Harafi Sea. Devonridge’s population swells as caravan after caravan rolls into the town. It is quite common to see Cloth-swathed Andolans, smothered in bandage-like robes, walking beside scantily clad warriors from the Zahedan Plains. The bluish-green skulls of calterians are often seen towering over the heads of the crowd, while grodgolyte traders natter to each other in their clicking, insectile tongue. Markets spring up selling every smoky ware from every shady corner of the continent. Vendors assemble a myriad of stalls, from the colourful to the outright bizarre. Makeshift brothels appear beside makeshift temples. There are displays of duelling, fist fights and feats of speed, the many rostrums graced with jugglers, fire tamers, criers, wrestlers and more. The air is filled with the aromas of exotic spices and smoked meats. At night, strings of colourful lanterns hang from the trees, draping their light across the streets. The celebrations culminate in the Pageant of the Gods, a parade along the main street in honour of Cha-Lei. As the festivities rise to their peak, the sky explodes with fireworks. It is not uncommon for celebrations to continue past sun rise. After Autumn Festival, Devonridge quickly reverts to the quiet town on the banks of the Rolwood River. Captain Rusk and his red capes will quickly eject any tourist who overstays their welcome. The farmers set about the task of preparing for the Autumn harvest, while the traders and merchants guild count their coins, and plan for next year’s Festival.